What I conceive is to be expected as to the map of Providence is very simple, and speedily to be shown. Turkey in Asia to come under the power of Russia, whereby it, in Scripture designation, becomes the king of the North, wherein Gog is identified with it, being brought up out of the North quarters. Turkey in Europe to be made, as far as Philip's power extended, Greece again and perhaps the courts of the Archipelago in Asia. Austria would probably take hold of the Serbian and Bosnian provinces, which were not part of the Grecian kingdom. Persia will be under the influence of Russia. I have a strong notion of the severance, in a great measure, of the Babylonish provinces from the minor Asiatic, and to be independent of them, though not of the power of the king of the North; Persia may be amused with, but he will not have the possession of some of them, while England will merely offend him on the other side, but it is on the former part I rest as facts as stated. I think Austria will be dismembered, and change its position. In Ezekiel 38:6 we have "of the north quarters, with all his bands" under Gog as their head, "chief prince" (or prince of Rosh) Meshech and Tubal. In Daniel the land of Mizraim does not escape, and then "the Ethiopians shall be at his steps." We have here then the two component parts of the Gentile portion of the great valley of Jehoshaphat. 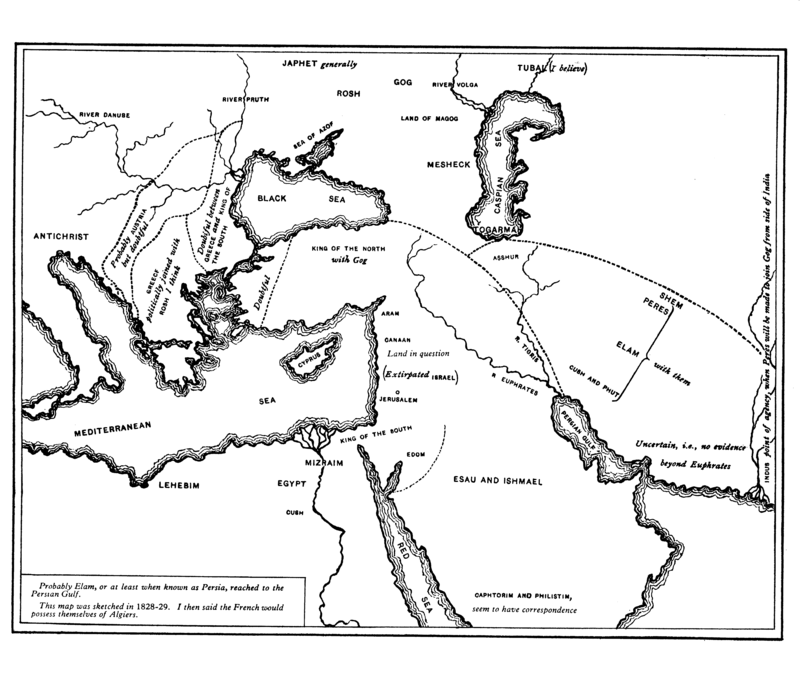 It is my opinion that the French will carry the power of Antichrist overrunning the Mediterranean, and I should think Greece, i.e., carrying them along with them, and should find themselves at the point of division just in the Arabian country, i.e., the point of contact, Jerusalem and Judaea as the southerns always have as we know. Russia, the northern Scythian nations, I am disposed to think the Turks also, but do not feel sure the position they will hold (it is as possessing Turkey, i.e., in Asia particularly, they will be king of the North - but see the distinction put between the Assyrian and Gog) Persia or rather Media and Persia - Peres (see Daniel 5) will be in their train, and also, so I interpret, the eastern Ethiopia or rather eastern descendants of Ham, just as the western or southern descendants of Ham will be "at the steps" of Antichrist or the mature apostate body, for they will be judged as Antichrist, Gog and Magog, for coming against the Jews. 193 As to Poland, it seems at present reserved between the two for squeezing out the Jews as it were, as in fact, I believe, they are a mixed race not properly eastern, Scythian nor western; but Sarmatia, southern of internal Africa and China will have, I conceive, no proper part in this great catastrophe. They are included in other descriptions at least as far as I see. It is to be observed that the Medians and Persians are different races, the former being Japhet, the latter Shem, i.e., Japhet and Shem bore a part in the taking and destruction of Belshazzar in his impiety, and I suspect Shem and Ham were in Babylon, i.e., Shem as ruler and Ham as the mass of the people. However that may be, we know that Ham possessed the southern parts of Euphrates, etc., i.e., we have Ham on the two rivers, the Nile and the great river, and separated by Shem, i.e., Judea formerly theirs in possession in Canaan. Esau and Ishmael holding Arabia - we thus readily account for the nations apparently the same in Antichrist's and Gog's army, in fact it is just what under the circumstances we might expect. I say "apparently," though Cush be mentioned in both; and there were undoubtedly descendants of Cush on both sides, for the beginning of Nimrod's kingdom was Babel, etc. So the word "Libyans" in Ezekiel is Phut, a son of Ham, and in Daniel Lebin; I should suppose the same as Lehabim the son of Mizraim. The annexed form of map will make it plain. The French, i.e., Western Europe under Antichrist, then will extend their conquests along the Mediterranean, Egypt not escaping. Gog, the chief prince of Magog, will possess himself of the rest of Shem, and therein of the eastern Cush and Phut. They meet naturally, the body of the Jews having come out of both, i.e., east and west (note, Uz was the son of Aram); specially Poland I suspect beginning it in Judea where the valley of Jehoshaphat and all related in Joel and Daniel take place, for there, it is manifest, all the powers of the world will be brought together as they have acted within the limits of God's known providence, and formed the subject of Scriptural statement as to kingdoms, i.e., powers in the world previous to the interposition and restoration of the four great kingdoms with "the power" of Ezekiel, acting as described in Joel; and of other types the Gog and Magog of Revelation includes all and runs over the whole extent of the inhabited earth, not the powers of the earth as in the formative system, for then the system is formed and it is re-action, in God's wisdom and permission, of judgment on those not truly of it, as I am led to believe. 194 The Noachic and Abrahamic earth under Providence so as to leave the will of man to act; see Genesis 10:1, 2-4, and compare also Ezekiel 38:13 and Genesis 10:7. For Daniel 11 compare Genesis 10:5, 13, also Noachic. Note, Nimrod was the first gibbor-tzayid (mighty hunter) in the earth; gibbor-tzayid is "prowess," including craft, cunning, i.e., tzayid (hunting). It is an important characteristic word running through Scripture; compare 1 Peter 5:3, Christ the Chief Shepherd. Compare also 1 Peter 2:22, and Genesis 6:4, 11. There is not a more important chapter in Scripture as to the providence of God than Genesis 10. We may enquire the names of the cities - this city-building is of Cain; see also verse 22. Does not this make part of Asia Minor Shem, though there were Ludim, sons of Ham?